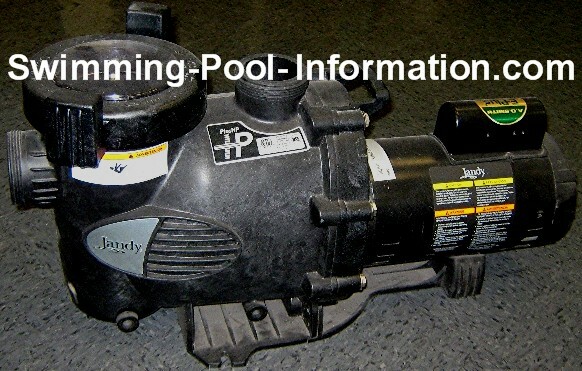 This 1 HP swimming pump shown below pumps almost 100 GPM(gallons per minute) at 50 feet of total dynamic head(a measurement of friction the pump must overcome due to plumbing restrictions,pumping through the filter,heater,etc.) 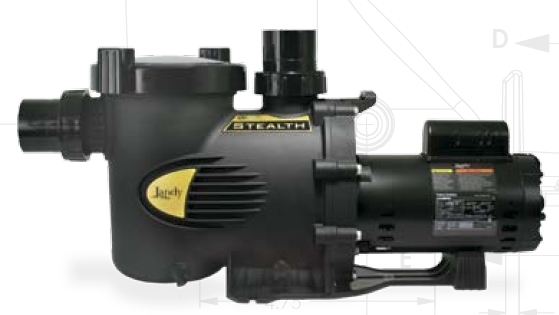 The swimming pool pump shown below is a Jandy Stealth Pump. Now this 1 HP pump shown below will only pump 38 GPM at the same total dynamic head as the pump above! 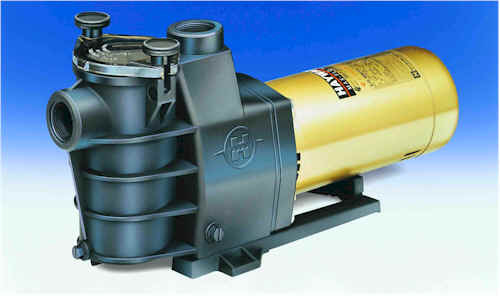 Its one of the Hayward pool pumps brand line. Also VERY important:the impeller on pump is matched to the motor specifications,so changing the motor HP or SF will not make a difference as far as volume of water pumped because the impeller still turns at the same speed. On the diagram above, this 3/4 HP motor has a service factor of 1.5 - meaning its true horsepower rating is a little over 1 horsepower. 2)The design. The pump on top has a newer,much more efficient hydraulic design. The photo below shows the Jandy internal design-the basket is at left,the impeller is at right (red). 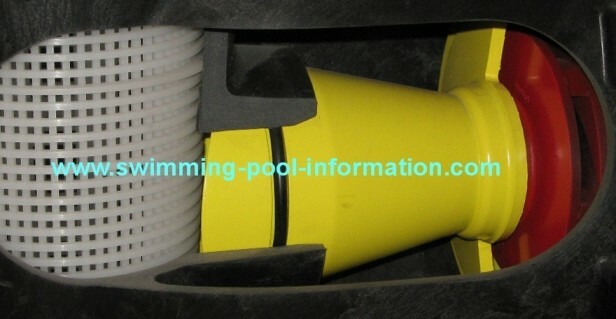 The yellow throat section provides a gradual reduction in size from the basket to the impeller face....the Hayward pump also has a similar throat section but it is much shorter and not as hydraulically efficient. 3)The pump inlet/outlet openings. Although not as important as motor or design,the top pump has 2" fittings while the lower is 1 1/2"
So the MOST important thing to pay attention to when choosing a pump is the pump's performance curve and the amp rating(amount of electricity used) The amp rating is usually expressed as a dual number(5.6/11.2) The lower number is for 230 voltage,the higher number 115 voltage. If there is only one value for amp rating,its a 230 only voltage motor. This information can be found online at most manufacturers websites. When viewing the pump's performance curve,a good rule of thumb is an average pool has around 50 feet of dynamic head. There are ways to check this on your pool,but I will get into that on a later section on plumbing and hydraulics. So you just pick the pump that has the highest performance for the lowest amps? Not always-in older pools with 1 1/2" or 1 1/4" copper plumbing,you can actually strip the copper from inside the pipe due to friction from water velocity! Usually,if you have 1 1/2" or smaller plumbing,and you are installing a modern,high efficiency,fully rated pump,(meaning high service factor) 1/2 HP is usually more than adequate. There may be exceptions to this - for example your pump is unusually far away,then a 3/4 HP may be needed. 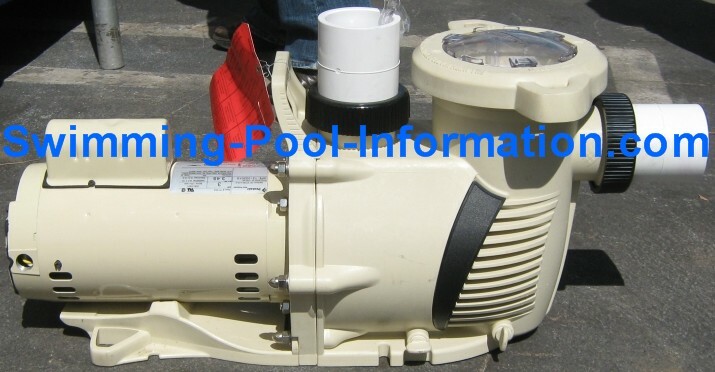 Below is a 1/2 HP swimming pool pump I installed with a cartridge D.E. filter. The old swimming pool pump was I believe a 1 or 1.5 HP bronze pump. 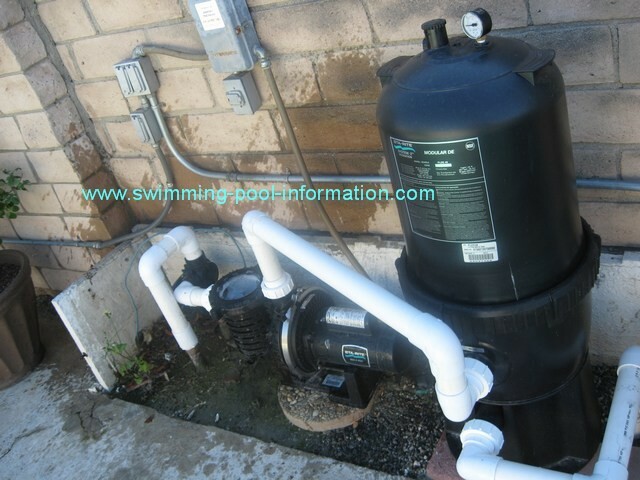 This new swimming pool pump and filter was a great improvement in flow and much less noise than the old system. Although I used 2" plumbing,you can see the pipe drops to 1 1/2" before it goes into ground. The return size was even smaller, 1 1/4" plumbing-I dared not go higher than a 1/2 HP pump. On the other hand,if you have a pool with 2.5" or 3 " plumbing a higher horsepower pump running for less time is the most efficient way to go (Pentair Whispeflo XF shown below 1/2 HP pump).